The vote on whether the UK should remain in the European Union is just days away (June 23), and the latest polls suggest the result is too close to call. Leaders in every sector are now being forced to consider the possible impacts of a Brexit on their field, and financial crime and compliance is no exception. But given the highly politicised nature of the debate, it can be too easy to lose sight of the evidence. So this article will explore how a Brexit might affect the UK's ability to detect and combat financial crime: anti-money laundering (AML), anti-bribery and corruption (ABC) and sanctions. The EU Fourth Money Laundering Directive (4MLD) is due to come into force in June 2017. This might lead to worries that a post-Brexit UK would not be part of this attempt to make it more difficult for people to launder ill-gotten gains through banks and other regulated entities. The directive puts further scrutiny on the risk based approach, particularly around situations where simplified due diligence may be applied and requires regulated entities to find out more about the money they hold. But the 4MLD stems from the latest recommendations of the Financial Action Task Force (FATF), an inter-governmental body that develops and promotes policies to combat money laundering and terrorist financing. The UK, most EU member states and even the EU Commission are members of the FATF and therefore bound by its AML rules. So the UK would still need to abide by the FATF's requirements regardless of whether it is 'In' or 'Out'. In fact, the UK has often been ahead of the European curve on AML legislation. In many cases it has 'gold plated' the EU legislation, for example it has adopted an 'all crimes approach' to AML regulation, so there is no de minimis level of predicate offence below which offences need not be reported. The UK already has its measures in place to increase transparency of beneficial ownership of companies. The London Anti-Corruption Summit in May 2016 showed Britain's willingness to not only lead the way in setting up a public register of beneficial ownership, but also to encourage other countries to create their own registers. EU members France and the Netherlands have committed to setting up registers of their own. Now, any foreign company that wants to buy property in the UK or bid for government contracts will be required to publicly disclose their ultimate beneficial owner. Patrick Moulette, who heads the Anti-Corruption Division at the OECD, called this "a significant step in the right direction". It seems the UK has the legislation and the political will to combat money laundering, whether or not the country sits within the EU. The EU is committed to facilitating information-sharing between its member states. If Britain were to leave the EU, some are worried that it would no longer receive information about suspected bribery and corruption from across the EU, which would make it harder for the UK authorities to detect and take enforcement action against corruption. As Andrew Simms of the think tank New Weather Institute wrote in the Financial Times in January 2016, solutions to financial crime "require international collective action, which a Brexit from the EU would seriously undermine". But it is unclear what the EU would have to gain from excluding the UK from this information-sharing process, since European countries also benefit from the UK's willingness to provide information. There is already precedent for the UK to share information with other non-EU countries. Regulators in the US, UK and Australia are among those working together to investigate companies and individuals implicated in allegations of bribery by Unaoil to secure billions of dollars of government contracts in the Middle East and Africa. Moreover, at the London Anti-Corruption Summit in May 2016, the UK announced that it will host a new International Anti-Corruption Coordination Centre in London to work with enforcement agencies in the US, Canada, Australia, New Zealand and Switzerland on cross-border investigations. The global trend in enforcement is towards countries sharing information with each other, not hiding it. The UK also has one of the strictest anti-bribery laws in the world: the Bribery Act of 2010. The Act stemmed from the OECD's anti-corruption convention in 1997 and would be unaffected if the UK was no longer subject to EU law. The NGO Transparency International describes the Act as "among the strictest legislation internationally on bribery", so it seems unlikely that Britain outside the EU would be seen as a softer touch on bribery and corruption. The most obvious area in which Brexit could affect financial crime is that the UK and Europe could develop quite different strategies for export and sanctions controls. Although different countries often work together to impose sanctions against doing business with companies operating in a particular country, the conditions of these sanctions can be very different. Recently, the EU eased its sanctions against Iran, while the US' sanctions remain more restrictive. This has meant EU business have begun to deepen their relationships with companies in Iran while the country remains off limits for most US businesses. UK policymakers have in the past made exemptions for politically exposed persons. For example, the Financial Services Bill excludes domestic PEPs such as MPs from money laundering enhanced due diligence checks. This hints at a divergence from EU policy, since this is against the provisions in the Fourth EU Directive which will require a more comprehensive definition of 'prominent public person'. This divergence could be magnified if the UK were to no longer be subject to EU law. But there is no evidence that the UK and the EU would adopt drastically different approaches to sanctions against PEPs. Moreover, much of the policy on sanctions comes from UN resolutions which would still bind the UK regardless of its European status. The UK's laws on the financing of terrorism fall under United Nations (UN) Security Council resolutions. The UK is signed up to other international conventions which pertain to terrorism, including the Vienna Convention, the Palermo Convention, the UN Convention against Corruption and the UN Convention for the Suppression of Terrorism, so UK law is bound by these requirements. The UN is not the only inter-governmental organisation with a strong commitment to identifying money which funds terrorism. The FATF also develops policies in this area, which bind the UK and most EU member states equally regardless of the UK's relationship with Europe. If the UK repealed the European Communities Act of 1972, new laws would need to be passed to fill any legislative gaps that have opened up. This might lead some people to worry that there is a period in which the UK is legislatively paralysed and unable to take action in some areas. But under UK law, where there are terrorist concerns the authorities can designate financial sanctions targets and apply export and other controls to goods of any description. So there should not be any window in which the UK has less power to act on suspected inflow and outflow of money related to terrorism. With the upcoming referendum so keenly contested by rival politicians, it can be difficult to work out what would be the actual impact of Brexit on the UK's ability to combat financial crime. Moreover, many details of how a 'Brexit' would look in practice will only become clear if the country does vote to leave. But although there are specific EU policies against financial crime, these usually fall under or follow on from inter-governmental policies, for example from the UN, the FATF and the OECD. These inter-governmental policies would continue to apply to the UK, whether or not it is in the EU. The UK also has its own legislation in place against financial crime, and this is often ahead of the European curve. David Cameron positioned the UK as leaders in the fight against financial crime by organising the London Anti-Corruption Summit in May 2016. 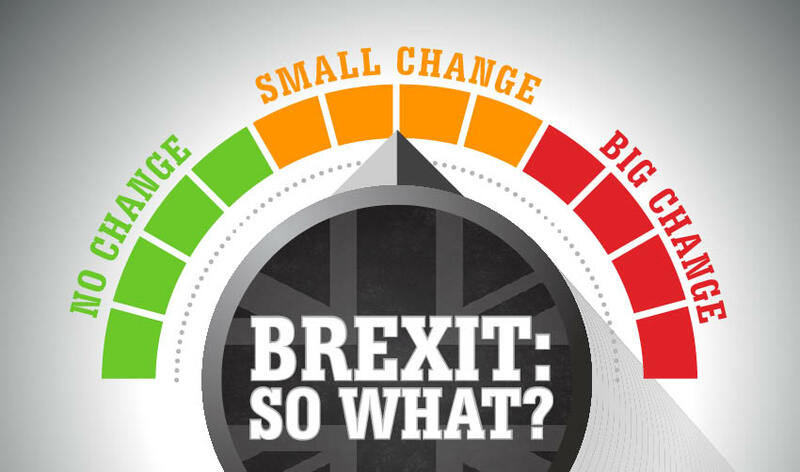 Commenting on the outcome of the polls on 23rd June, Professor Dan Hough, Director of Sussex University's Anti-Corruption Centre, "As with most things to do with the Brexit debate, the impact of a 'Leave' vote in these areas is clouded in uncertainty. On the one hand EU institutions (of all sorts) provide useful fora for unofficial collaboration and co-ordination. UK representatives can and do discuss a range of 'off agenda' items with EU colleagues, but if the UK leaves the EU it will inevitable limit opportunities for doing this. thematic, and there is a case to be made that these relationships will simply carry on as normal no matter what the Brexit vote". We will only know for certain the effect of Brexit on the UK's ability to tackle financial crime if the country votes 'Out' on June 23. But it seems unlikely that it would have a significant effect on the UK's ability to combat financial crime.